Joy De Vivre Design: My baby had an accident! When I came home from work I noticed that Barkley had gotten himself into something and took a chunk out of his nose! 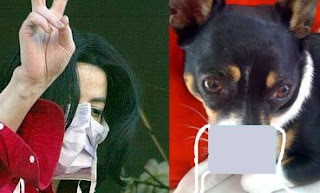 Now he looks like a celebrity and no not Toto or the dog that played Air Bud, but MICHAEL JACKSON! Get well soon pup! And please don't let me catch you dangling your stuffed dog out of the window! Oh, poor Barkley! Hope he's feeling better. Oh, I hope his nose heals quickly! What a cutie! Omg! I like him better than MJ, though.